Build-in Anti Virus and Smart Screen filter Doesn't slow the system down unlike most anti virus software, and faster than Windows 7 when enabled by default. Faster boot/shut down/sleep/wake times I run both Windows XP and 8 on the same hardware, and the latter does boot a lot faster. Hyper-V (previously only a Windows Server feature that which lets you run a virtualized OS)Infinite backwards compatibly. 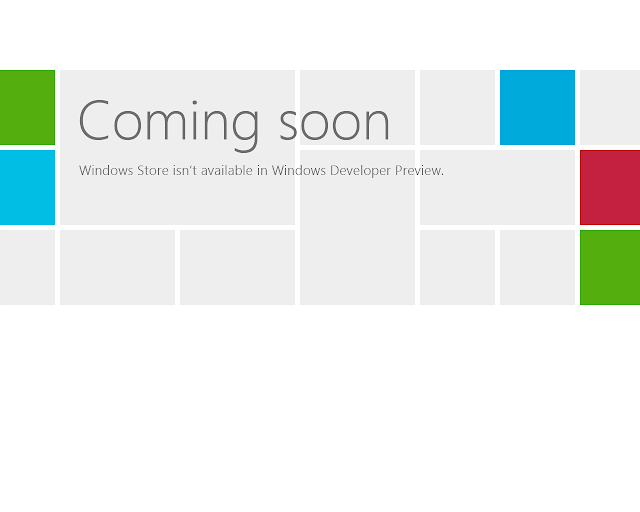 If something down work on Windows 8, just install XP or even Windows 95 in Hyper-V and run it on that. New File History feature to recover old files. Better file management Also allows you to pause file copying too. Completely overhauled boot system and new graphical screens The screen that lets you select multiple operating systems now supports touch, mouse and keyboard, and no more white text on a black background. Disk Check could also be accessed from there. 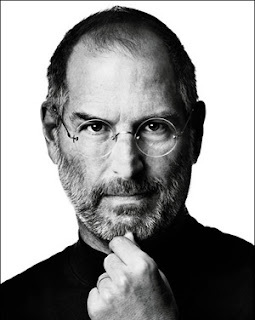 One of the greatest pioneers in shaping the world of information technology, Steve Jobs had helped changed the world that had span many decades. He envisioned having computers that were user-friendly to people that have little knowledge on computers, and also have one that is small enough that would fit into people's homes. He also reinvented the music and mobile industry. 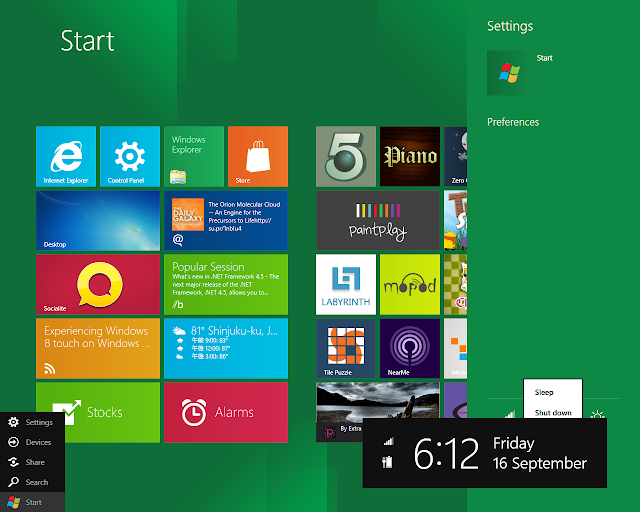 It features a new start screen, and the more familiar desktop screen somewhat secondary. 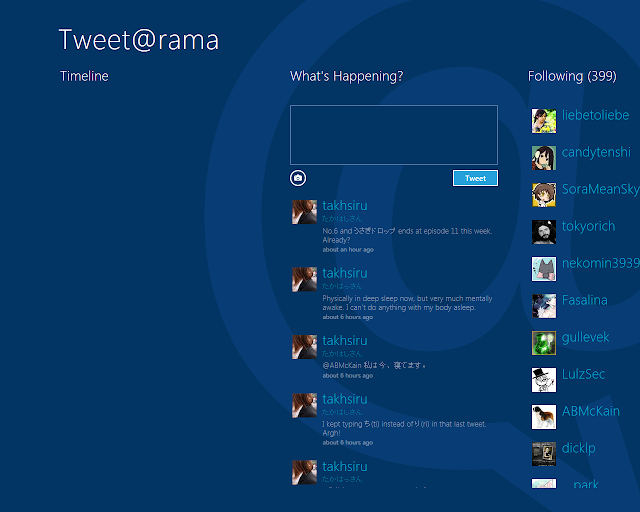 I don't have a touch-screen based interface, so bare in mind that this was used with a keyboard and mouse. Since the aspect ratio is 5:4, with a resolution of 1280*1024, certain features like snap to the side of the screen are unavailable. To access all programs here, press the WinKey and C. To have those black boxes at the bottom of the above screenshot to appear, just hover the mouse at the bottom left. Option to shut down, sleep, restart, etc., are in there too. Wifi could be selected either in the settings menu here, or the taskbar of the desktop. This is the weather app. Depending on your screen resolution, you can see only part of it, or the whole thing plus other cities you added. 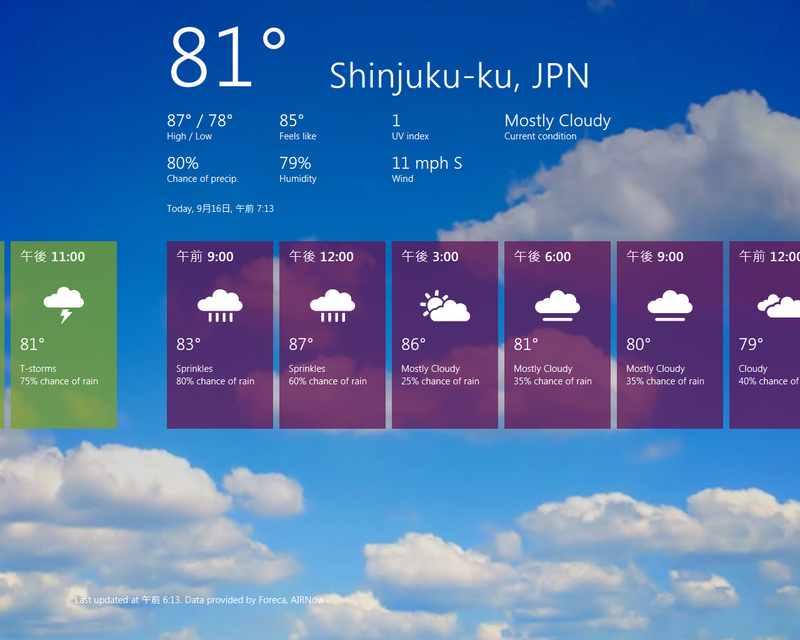 The background image is animated, which is based on the current weather and the time of the day. I don't know how to adjust the settings, but the date/time is in Japanese format, the temperature is in degrees Fahrenheit, and wind is in mph. Next is the Twitter app that it comes with. I don't see where the settings are, and clicking on a username will bring up the user profile on the Twitter website via Internet Explorer instead of the app itself. CJK characters don't seem to be rendered smoothly. For some reason, when I tweet from this app, the tweet went through, but doesn't update here. (I knew the tweet was successful via another device.) Another oddness is that my timeline is blank, though when I sign in with my other twitter account (below image), it appears fine. I don't know what the problem is. Next up is another social app, but for Facebook. 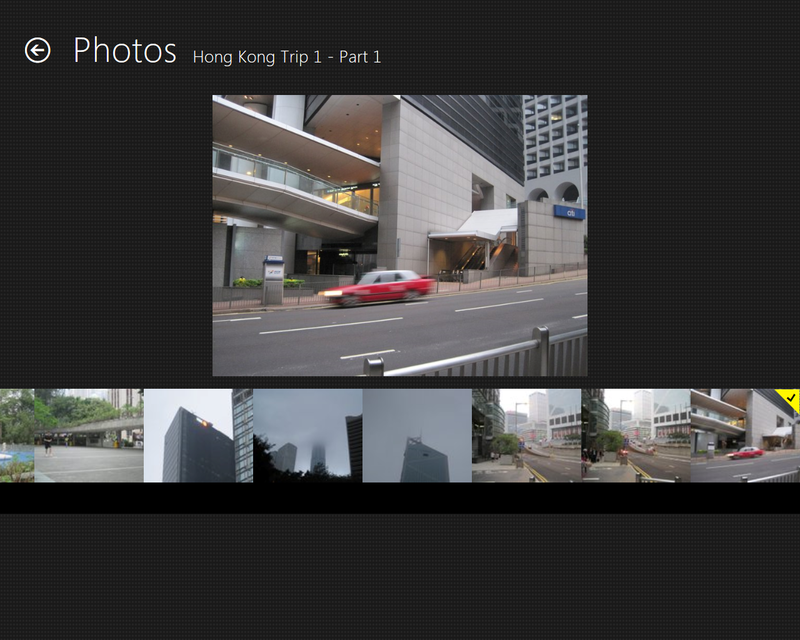 It features feeds from friends, your photos, profile, and the Foursquare-like thing called Places. 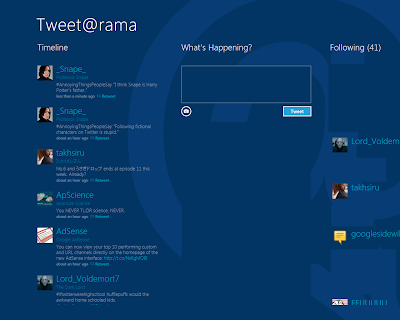 The interface looks like it could be improved further. 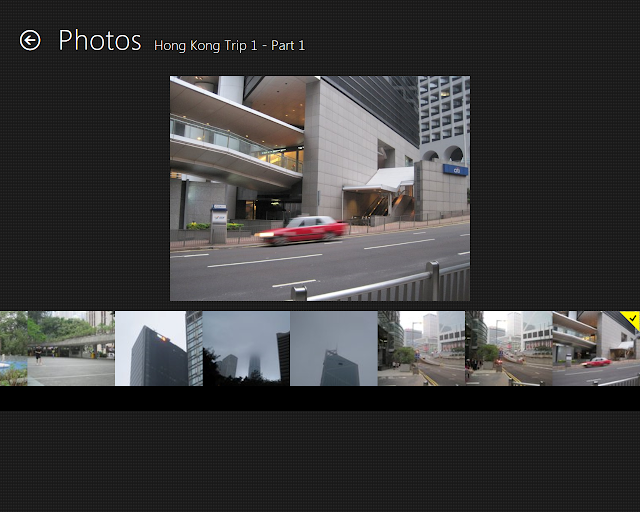 In the photos section, any images that are not of 1:1 aspect ratio have ugly black bars surrounding it, especially vertical images (not shown). The image thumbnails were simply resized instead of cropping it. I would like to try out other applications, but the app store isn't open yet. The apps that it already comes with seemed to be specifically designed for touch interface. They work with keyboard and mouse, but I don't feel comfortable using those with those apps. Overall, Microsoft has done some great effort in radically changing the user interface that has not been seen since Windows 95 with an interface called Metro. Metro is based on the (now discontinued) Zune player interface and has been applied to UIs, such as Windows Phone 7 and Xbox Dashboard. 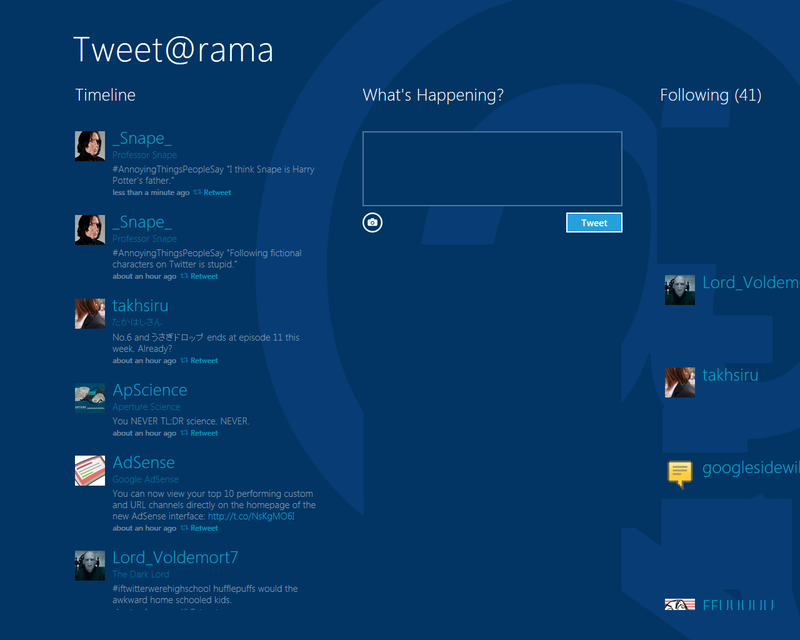 However, I have to say that it's confusing to people who have been used to the older interface. I know a lot of companies that still run Windows XP with the classic interface (Win2k/ME/98-like) today. Then again, I don't want to see a visibly old interface that is still being used a decade later. Countries around the world are switching over from analog to digital signals, with both being provided during the transitional period. Some countries have already shut down the analog signal, while others are in the early/planning stages of it. What I'm discussing here is talking about the over-the-air signals, and therefore, TV content provided over the cable, mobile phone signals, and satellite are not covered in this. So, what is so great about it? Well, for one thing with digital, you are either going to receive a crystal-clear image or none at all. But wait: doesn't that mean that those who are already receiving a weak analog signal, even with a signal booster, would not receive at all? Well, it depends on how far away you are from the transmitting tower. Since digital signals uses less bandwidth (and therefore less power) than analog to get a clear image. you would still receive a very clear image. To put that in perspective, a DVD video movie in 576i (PAL/SECAM) takes up the whole disc, but if stored as data at 720p, compressed, you could store about 12 times more on the same disc and in higher quality. If your signal is poor, but enough to not get a "no signal", you may see odd-looking squares that might be green. Another thing you may face is receiving the signals. In general, any new TV sold in your area today should be able to receive these signals without any additional hardware. If you somehow have a TV that could only receive a different type of digital signal, or, more likely, an older type of TV that doesn't even know what to do with the digital signals, you may need an external device to help receive the digital signals and send that signal to the TV via the same input you might have used for your console/DVD player. So, what are they going to do with the former analog frequencies after the shutdown happens? Well, who knows? Reserved for emergency use, future cellular signals (lower frequencies = larger coverage). One thing's for sure is that if you are used to a grainy analog TV signal and suddenly see the digital HD version, you wouldn't want to turn back. Though, you might not even watch TV for various reasons. What Makes A Good UI of a mobile device? Having use several different devices from various brands, including Samsung, Nokia, Sony Ericsson, Apple, and the little known brands from China, I have noticed several points that can make a difference between easy to use and not having a good experience. What I'm describing are ones released since 2007, the year the iPhone came out and touch screen were starting to become common. The iPhone was a revolutionary product at the time it came out, and made all the mobile phones that were out at that time look outdated. Stylus pen: This is a relic from the PDA era that is somehow carried over. The response times are not ideal and the items to select are too small. You might also need to apply pressure while selecting too. If you have lost the stylus and it only has an on-screen keyboard, you are going to have trouble entering text because the selection is too tiny and not responsive. Accessibility: Most of the phones seem to have this as the lowest priority to the point that most don't even have any. With a keypad, you could just memorize which sequence does what without looking, but, except for the iPhone, you can't tell what you are selecting. Multiple Language support: Until recently, support for the displaying text of multiple languages is quite poor, but being able to change the menus in the settings in another. As the second lowest priority after accessibility for mobile devices, it only includes commonly used languages of the market it's sold in, or languages like English, French and German. Apple is the only one that supports the most number of languages. User Interface: With the exception of iOS, Android, Maemo, and WebOS, the user interfaces seemed kind of dated with problems including the above. For smart phones that run on Windows Mobile or Android, the manufacturer might do some customizations that would either make it better or worse. Updates: The operator or the phone manufacturer is supposed to provide updates, but for reasons that have nothing to do with the hardware, they would only do it for a while, and then never. Applications: Until the Apple and Android app store came along, applications built-in are quite basic and to find more are hard to come by. It was almost non-existent as apps could be installed, but there was no centralized place for it.